A little ninja with a huge dream (to become the leader of his village) stormed the world! And in his wake he left a lot of awesome... figures?! 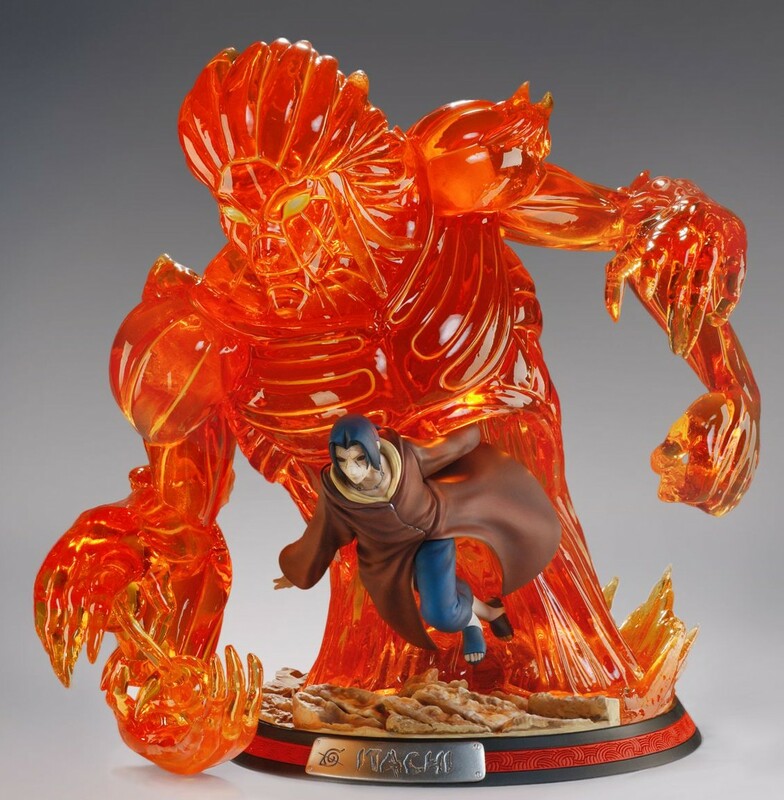 Let us introduce to you some of the coolest Naruto figures available! Believe it! In 1997, Shonen Jump made history by releasing a small gem that evolved into a treasure box of wonder. Naruto and Naruto: Shippuuden tell the tale of a young outcast who hopes to one day become the leader of his village and capture the hearts of millions in the process. With an engaging storyline and memorable cast of characters like Kakashi Hatake, Orochimaru, Uchiha Madara, Kimimaro, and Shikamaru, the Naruto series does not only have flashy and tactical action but also heart to keep it all together. Whether you are grieving the end of the manga or you are watching the Filler Chronicles Arc of the anime, you can never have enough Naruto figures. To help you choose just the right ones, we undertook this dangerous S rank mission to bring you nothing but the very best! Flashing to the opening spot on our list is the figure of the avenger of the series, Sasuke Uchiha. Medicom Toy released this electrifying 30 cm (11.7 inches tall) figure as a part of their Project BM! 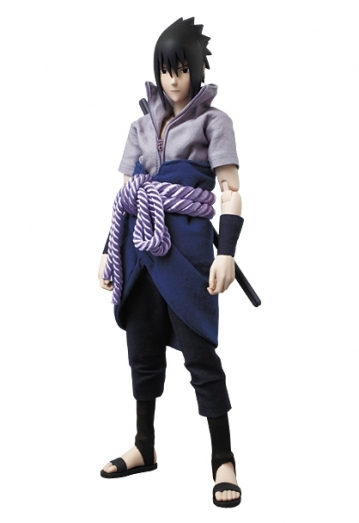 line in March 2012.The figure depicts Sasuke in his Naruto Shippuuden outfit which was made from real fabric! Also his girdle is made from a high quality rope! This Sasuke figure uses a modified RAH301 Kai body, which makes the figure highly posable, with an additional head and hand attachments. The standout head attachment has to be Sasuke with his awakened Mangekyou Sharingan. The different hand attachments include ones holding his sword and others with Chidori (particle effect skill). Also, a stand is included with this PERFECT-STUDIO sculpted figure. The price on the western auction market goes to around 149,000 yen (around 1320 US dollars) but be sure to check the secondary market first, where if you hurry, you might just snag a deal of a lifetime. Next figure on our list certainly is one of a kind. 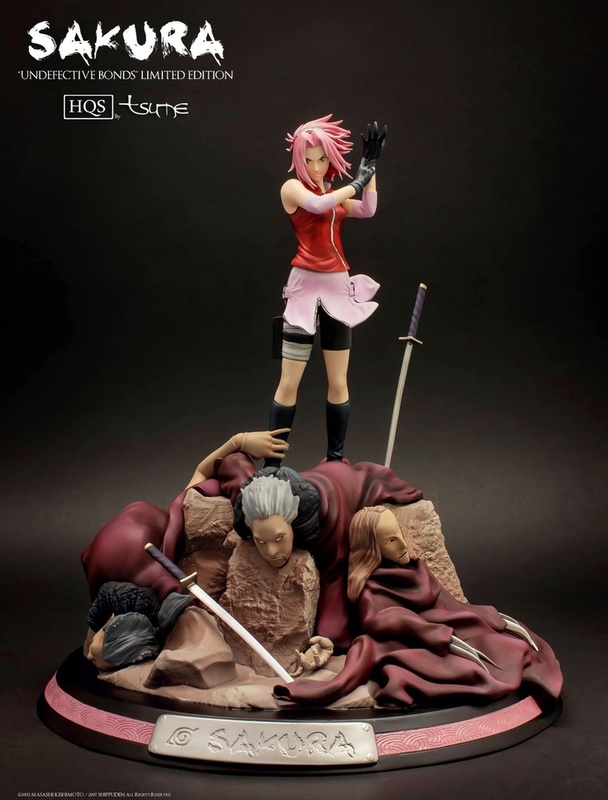 This time we have a figure of Haruno Sakura standing defiantly on the top of Sasori’s defeated puppets. The figure is manufactured by Tsume and it was first released in November 2013. She adjusts her glove while her hair and clothes are gently moved by the wind. Sakura is not the only one masterfully sculpted by Cyril Farudja. The puppets beneath her feet are given just as much attention as Sakura hearself , with their faces and clothing faithful to the source material. The whole figure is made from polyresin and it stands 29 cm (11.31 inches) tall. On the base of the statue there is a metal tag with “Sakura” written on it. Only 600 pieces of this figure have been made which makes it really desirable with the collectors. That desire is reflected in its price which is around 174,000 yen (around 1540 US dollars). In our third spot, we have a statue of a fan favorite Naruto character, Uchiha Itachi. This figure was released in September 2015. The Itachi figure depicts the scene from the Uchiha brothers’ battle against Kabuto (battle can be seen here). That is why Itachi is depicted in his Edo Tensei form. To say that this figure of Itachi summoning Susanoo is cool would be an understatement. First off, Itachi is sculpted mid motion with Susanoo appearing around him to illustrate the motion and fluidity of his battle. On Itachi’s face we can see his Sharingan. The Susanoo has been brought to life with the clear resin and to further make it look like its anime inspiration, they used various tones of orange and yellow. Cyril Farudja did an amazing job with all the details while Mickael Gros did not disappoint with his colors. On the base, you have a standard HQS metal plate with Itachi's name on it. Next to Itachi’s name, they even added his crossed Hidden Leaf emblem! The figure itself is huge, being 47 cm (18.33 inches) tall and there are only 800 copies of this figure made. To own this memorable depiction of the Uchiha brother’s battle you will need around 195,300 yen (approximately 1700 US dollars). 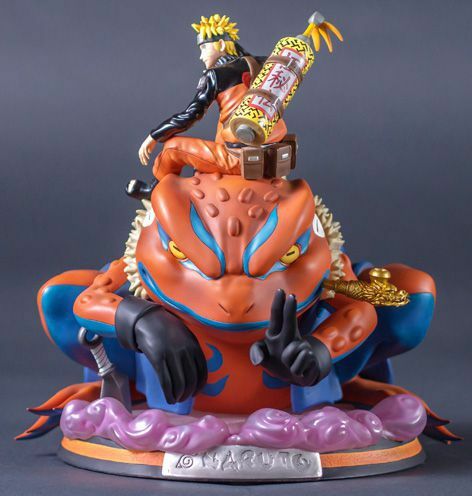 Number two on our list is a figure of Naruto summoning his frog companion Gamakichi. This figure was released in February of 2013 by the manufacturer Tsume which, by the way, hails from Luxembourg. This Naruto figure was sculpted by Cyril Farudja. The sculptor presented both Naruto and Gamakichi in great detail. Naruto is shown wearing his orange and black jumpsuit with the summoning scroll hanging on his back. You just need to look at the scroll to appreciate the work put into this statue where even the leather belts were meticulously sculpted. To make him distinct from Naruto and preserve his visual distinctiveness, Gamakichi is painted with a slightly different shade of orange. The base represents the dust and smoke which accompany summoning in the Naruto universe. This 36.5 cm (14.24 inches) tall figure is made from polyresin. There are only 1000 of these figures made and to summon it to your collection, you will need around 196,300 yen (around 1724 US dollars). The top spot on our list belongs to none other than the future Hokage, Naruto Uzumaki. 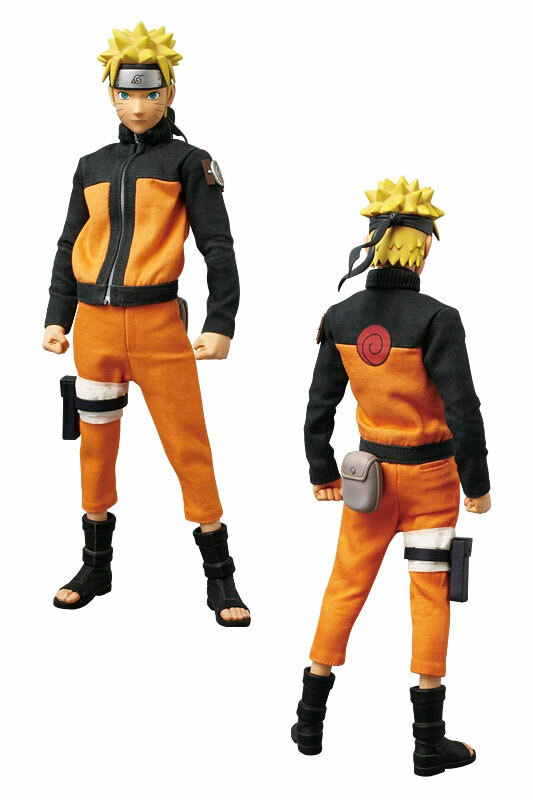 This figure of Naruto was released by Medicom Toy in March of 2012 as a part of their Project BM! Line. PERFECT-STUDIO is to be credited with sculpting this 30 cm (11.7 inches) tall figure. The base of the Naruto figure is RAH301 Kai body and the figure is made with a mix of ABS and PVC. What really stands out on this figure is the clothing and number of unbelievable accessories. Naruto’s recognizable orange and black jumpsuit is made from real fabric and, as a plus, it can be unzipped to reveal the necklace Tsunade gave him as a gift and his chainmail undershirt. He has two different face versions, one serious and one with a smirk, while his hand attachments include ones holding a kunai and a rasengan. In the western market, this figure can cost you up to 205,000 yen (around 1800 US dollars), but if you jump to the secondary market, a special, limited, once in a lifetime offer of around 16,500 yen (around 145 US dollars) is waiting for you. The Naruto series, with its fan base numbering millions, is dear to a lot of people and with the manga finished, we hope that these figures will remind you of all that the show meant to you. Until next time, enjoy in these wonderful figures. The Elric brothers' journey was long and perilous and to honor it properly, we have gathered these five figures from the show that will surely add a little extra magic to your collection.